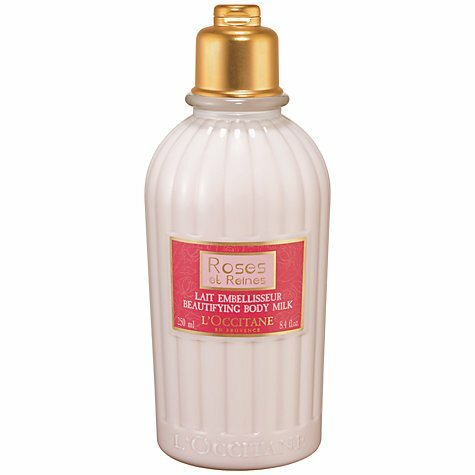 L’Occitane Roses et Reines Beautifying Body Milk (250ml). Enriched with rose water, the Roses et Reines Beautifying Body Milk deliciously melts into the skin to moisturise as it envelops you in an elegant rose scent. Skin is left delicately perfumed with a velvety, floral fragrance that combines extracts of roses from Grasse, Bulgaria, Morocco and Turkey with a unique rose extract from Haute-Provence. The Roses et Reines collection uses rose extract derived through enfleurage, a traditional process made innovative by the L’OCCITANE research team. The freshest of rose petals are steeped in oil, allowing it to become saturated with the natural fragrance of the rose, resulting in a fruitier scent. Skin is left delicately perfumed with a velvety, floral fragrance that combines extracts of roses from Grasse, Bulgaria, Morocco and Turkey with a unique rose extract from Haute-Provence. The Roses et Reines collection uses rose extract derived through enfleurage, a traditional process made innovative by the L’OCCITANE research team. The freshest of rose petals are steeped in oil, allowing it to become saturated with the natural fragrance of the rose, resulting in a fruitier scent.